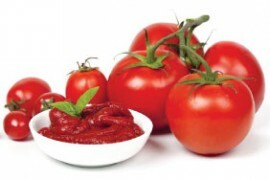 Tomato paste is a product derived from tomatoes. During the process of production tomatoes are mashed to obtain homogenous mass, and then such mass is being concentrated, particularly by means of boiling out. Tomato paste differs from tomato puree by higher concentration — the content of dry substances in it should be 20 to 40 %. Homogenous concentrated mass of smudging texture, without dark impurities, residue of skin, seeds or other rough particles of tomatoes. The dry substances’ content is 36-38%. It can be used in the production of juices, sauces, ketchups, various marinades and fillings.